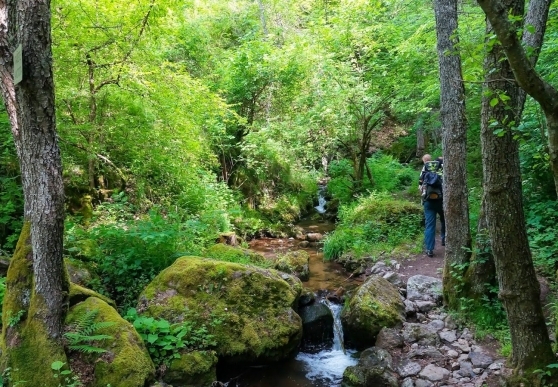 Along The Devinska River in the Western Rhodopes an atractive ecopath is build. The path impresses with its metal bridges, staircases and rest areas, and is a favourite place for walks for tourists and local people. The ecopath starts from the recreation area Struilitsa which is known for its outdoor swimming pools. There are therapeutic pools, a steam bath, sauna, Jacuzzi. The well-maintained eco path takes the visitors to the to the chapels St. George, The Holy Spirit, and St. Elijah. The recently renovated fourth chapel St. Pantaleon completes the spiritual integrity of the village resort. Actually, The Devin River Valley is the newest protected area in the region. It is forbidden to kindle fire here, except for the spots designed for this purpose. A 3-kilometer long fishing zone is also created in the area that offers excellent conditions for Balkan trout fishing. The protected area The Devin River Valley is particularly appealing to tourists. This picturesque gorge boasts an unusual landscape and remarkable rock shapes and formations and is home to rare and protected animal and plant species, including the renowned endemic Haberlea Rhodopensis and the chamois. The area is also one of the best natural habitats for the otter, the red deer and the bear. The river has carved many beautiful ponds and meanders that reach a depth of up to 2-3 meters. From here it will take you only 30 minutes by foot to get to the Samodivsko Praskalo Waterfall. The waterfall is exeptional and deserves seeing. The total lenght of the main trail Struilitsa-Kaleto-Lakata is aproximately 4 km. It takes about 2-3 hours to travel the path in both directions.